Get where you need to go. Pay a lot less to get there. Now there's a more affordable way to get to work, school, shopping, day care or anywhere else you need to go. It's ORCA LIFT, a new, reduced transit fare that can help you get more out of your public transportation system. Once you qualify for the ORCA LIFT program, you'll receive an ORCA LIFT card registered to your name, with the same features every ORCA card has. You can load an E-purse value on your card to pay for trips one at a time, or load a discounted monthly pass that lets you take unlimited trips for an entire month. But what makes ORCA LIFT special is you have all the power and convenience of the ORCA card system at a fraction of the cost. If your card has expired or will expire within three months, you may apply to renew it. The income requirements for renewals are the same as for new cards. Review your household income guidelines or call (206) 553-3000 or (800) 756-5437 to see if you qualify. Eligibility is based on your household income. Apply at any one of the authorized enrollment offices around King County and get your free ORCA LIFT card at the same time. Load and use your ORCA LIFT card on transit like any other ORCA card user, and SAVE MONEY! Just like any regular ORCA card, load E-purse value or a monthly pass on your card before you start to use it. Visit any of the ORCA revalue locations around King County to load your card. Load a monthly PugetPass for unlimited rides during that month—a good choice if you use the card all the time. Use the E-Purse to load between $5 and $300 on the card—a good choice if you use the card only occasionally. Tap the card reader when you board. Go where you need to go! You’ll pay only $1.50 per trip, any time of day, for one-or two-zone travel on King County Metro Transit buses, Sound Transit Link light rail, and the Seattle Streetcar. Kitsap Transit bus trips are $1.00. ST Express buses are $1.50 for one-zone and $2.75 for two-zone. Sounder train fares are distance based and range from $2.75 – $4.25. So, if you took two bus trips a day, five days a week on Metro Transit across two zones during peak hours, you could save as much as $910 per year. If you are looking for a low-cost way to ride anywhere you’d like all day long, you can also buy a Regional Day Pass. Enjoy unlimited travel for only $4.00 per day! What about the King county Water Taxi? ORCA LIFT fares on the King County Water Taxi are $3.00 for West Seattle/Downtown Seattle and $3.75 for Vashon Island/Downtown Seattle per trip. People with household income of less than double the federal poverty level (as established by US Health and Human Services Department) qualify for ORCA LIFT. To get an ORCA LIFT card, you must be between 19 and 64 years of age. Children six through 18 are eligible for an ORCA youth card, which may be obtained free of charge by LIFT cardholders, and those 65 and older are eligible for a Regional Reduced Fare Permit (RRFP) card. People with disabilities may qualify for the RRFP card. If you think you qualify, visit one of the authorized ORCA LIFT enrollment offices with your income verification documents. The process takes just minutes. The office will confirm your eligibility, officially register you, and give you your free ORCA LIFT card. For a detailed listing of specific locations and operating days/hours call 206-553-3000 or 800-756-5437. Apple Health/Medicaid recipients: ProviderOne medical services card. Washington Basic Food Program recipients: EBT (electronic benefits transfer) Card. Temporary Assistance for Needy Families (TANF) recipients. With identification, Employment Security can verify that you received no income and are therefore eligible. Employed (paid in cash): Letter from the employer signed and dated with gross income for the client for the last 30 days; or a bank statement from you if you deposit your cash in their account. Copy of your most recent tax return. Income is based on the modified adjusted gross income on your most recent tax return: Form 1040 line 37; Form 1040 A, line 21; Form 1040 EZ, line 4; or completion of the self-employment worksheet. 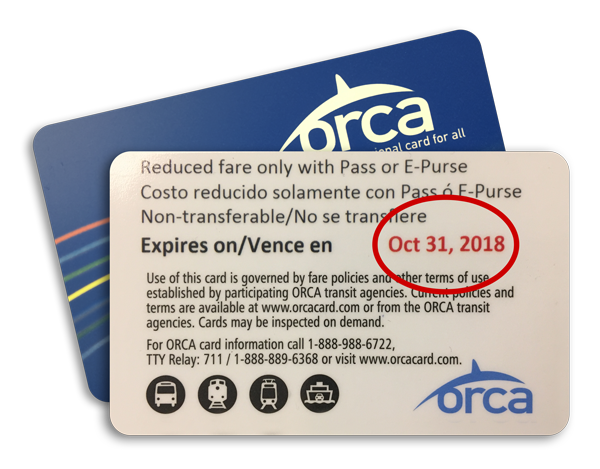 With an ORCA LIFT card you pay a discounted fare on all transportation systems that accept the LIFT fares until the expiration date, which is stamped on the back of the card. After the expiration your card will continue to work to pay your fares but you will be charged full fares. You may apply to renew your card to continue getting the discounted fares. Income guidelines, 200% of the Federal Poverty Guidelines, are the same as qualifications for an original card. There is no fee to renew your card. You may apply online if you are receiving benefits from the State of Washington, including food, medical, and/or cash benefits. A renewal card will be mailed to you if we are able to verify your benefits. Your online application will be processed in 7-10 business days. Apply in person at one of the LIFT enrollment agencies. Bring proof of your income or benefits to one of the enrollment agencies and in most cases, you will receive your renewal card immediately. If you are 65 or have a disability you may qualify for a Regional Reduced Fare Permit. Replacements of lost or stolen cards will continue to be done by Metro for a card fee of $5.00. Replacements of lost or stolen cards will continue to be done by Metro for a card fee of $3.00. Which transportation agencies accept ORCA LIFT? Currently, the ORCA LIFT reduced fares are offered on King County Metro Transit buses, Sound Transit buses, the Link light rail, the Sounder Train, the Seattle Streetcar, the King County Water Taxi, and Kitsap Transit buses. All other ORCA participating agencies will accept the ORCA LIFT card, but the cardholder will pay the current standard adult fare for service provided by those agencies. You can pay that fare with your card’s E-purse value or PugetPass that you have loaded. If you use your PugetPass to pay, you will be credited the trip value of your PugetPass, and will have to make up the difference with E-purse value or cash. Transfers are accepted with the ORCA LIFT card up to the value of the initial fare you paid. Cardholders can call 206-553-3000 for a current list of transit agencies that accept ORCA. How much does it cost to get an ORCA LIFT card? Nothing. The card is free to qualified individuals. If your card is lost, stolen or damaged, replacement cards cost $5. Users are responsible for the costs to load E-purse value or a monthly transit pass on the card. Will my ORCA LIFT card expire? The ORCA LIFT card is good for up to 24 months (two years) from the time you get it. After that, you can reapply. Your card’s expiration date will be printed on the back of the card. If your card is expired, you will need to go to an ORCA LIFT enrollment office to get a new card issued for another two year time period. What happens if someone qualifies for the ORCA LIFT program and later starts earning more than 200 percent of the federal poverty level? Anyone who starts out qualified for the ORCA LIFT program can continue until their card expires. At that point they will need to reapply for the program and prove their continued eligibility. How do I get an ORCA LIFT card for my child? Adult ORCA LIFT cardholders may get ORCA youth cards (age 6 – 18) free of charge. ORCA youth cards pay the standard youth fare when boarding Metro vehicles. ORCA LIFT cardholders may apply for a youth card at any ORCA LIFT enrollment agency. Agency staff can verify the child’s name and DOB, and the staff person’s signature is all that is needed to verify the child’s eligibility. The completed Youth ORCA LIFT form may be sent to the ORCA LIFT office, emailed or faxed. The youth card will be mailed to the cardholder. Cardholders may also complete and mail a Youth ORCA LIFT form, along with proof of the child’s name and age, to the ORCA LIFT office. The youth card will be mailed to the cardholder. The Youth ORCA LIFT form is available at enrollment locations. ORCA LIFT youth cards may also be obtained at the pass sales office or from ORCA-to-Go by providing a completed Youth ORCA LIFT form with either agency verification, verifying documents, or with the child. If the cardholder does not have the Youth ORCA LIFT Form, their ORCA LIFT card or other ID is needed.